The Milk Carton Kids Joey Ryan (left) and Kenneth Pattengale. They’ve only been a duo for five years, but Joey Ryan and Kenneth Pattengale of The Milk Carton Kids have already established themselves as an important voice in the contemporary folk music scene. With their signature close harmonies and flat-picking style of guitar playing, the Grammy nominated Ryan and Pattengale have garnered impressive fans that range from Gillian Welch to Garrison Keillor to Billy Bragg to Sara Bareilles. In anticipation of their Santa Barbara performance, I spoke over the phone with Ryan about their new record Monterey, bucking musical niches, and the luck of finding a partner with whom you click. I’ve been listening to your album, Monterey, quite a lot… I’m sorry. You must be going through a hard time. Well, I am now! I’m just kidding. Monterey is deceptively beautiful it took me a few listens to realize how melancholy it is lyrically. Yeah. I’m glad it snuck up on you. Were you guys dealing with something particularly difficult while writing the record? Yeah. You know, we’re not sad people, but I think even when good things happen, even when things move forward, even when we get what we want and we make progress, there’s always the ability to focus on the things that are ending, the things that you sort of leave behind in order to move forward, and maybe we got focused on those during the writing of this album. I don’t mean that as a criticism. I think it’s really reflective and thought provoking, actually. Thank you. I would never take sadness as a criticism. If we are being, if our music is invoking that level of emotion, then I think it’s a job well done. So you guys have only been around for a few years although I feel like you’ve been in the ears of people for a long time. We met five years ago, and we named ourselves four years ago. You’ve had some pretty remarkable successes quickly. Clearly the dynamics between the two of you is electric. You know, we had been solo artists each for about eight years, before we met and so in a lot of ways once we found ourselves in this collaboration, we were ready really to go full bore. And I think we had a good idea of what that meant, in terms of how much we would be on tour, how much we would be writing, how much we’d be releasing. It just all felt really good and felt really fun, and from the beginning, people were very receptive to it. So we had a lot of encouragement, sort of kept us going. That’s some good luck to be able to find such a fit. I think some people are meant to have partners. Other people are meant to go it alone, and both of us are demonstrably the types that need partners. Did they say that? Yeah, well, and they’re right, of course. But, you know, we’ve managed to find our way I guess without it all. I still think it’s fair to say that if we would have succumbed, or still could, to more commercially viable formulas, we might have more commercially viable releases. My guess is that you two are doing it more for your love of music than stardom, considering that you’re sticking to your guns. Yeah, I mean, if we weren’t making a living at it, the pressure would be greater to find a way to love something else. But we really do love this, what we’re doing, and we’re doing fine, and so we’ve successfully fought off the first round of influences that would have taken us in another direction and everybody seems to be at peace with it now. The thing is, you add those drums or whatever, and I don’t know if it makes the music better, just different. That’s right. So, if it sounds good the way it is, why change it? But I guess people want to slot you into a box that other people have made successes of. Yeah. That’s exactly right. People…don’t really know what to do with [us]. Who do you guys think you’re similar to? I know you have played with Old Crow Medicine Show, but they’re not exactly your music, I don’t think. No, I don’t think so, either. I think that they’re, well, I guess, despite my intense and deep respect for them as musicians, and also for Ketch [Secor] and others, as song writers — because I really do think they’re wonderful song writers — the intention behind [OCMS] shows and albums is almost the opposite to ours. They are sort of a party with sing-alongs and our music gives off more the vibe of a recital. It’s a totally different experience, to see either of the two bands play. Of course, if you dig deeper than that, the music comes from the same place, it comes from the same heart. But the execution of it has the opposite intention. You know, I find a lot more of a kinship with, well, there’s a lot of duos with whom I think the appropriate comparisons are drawn, from which the most broad being comparisons to Simon and Garfunkel and the Everly Brothers to the ones that are probably more related to us, like Gillian Welch and Dave Rawlings. Or the Louvin Brothers or Ricky Skaggs and Tony Rice. When they have their duos, they sort of have a minimalist approach to hopefully very fulfilling and complex music. I think that’s been done by duos over the last century, many, many times, and I find a real kinship with those duos. Do you study 1930s recordings of Americana or anything like that? We’re not steeped in the tradition the way some of our other peers are. We didn’t grow up with it; I grew up with more the music of the ’60s and ‘70s. And as we’ve learned more about traditional music — especially from our friends who grew up in the bluegrass tradition — we’ve gotten exposed to a lot more of what went on in the decades prior to that and so. But you know, it’s not something that I think is in our blood….Speaking for myself — not Kenneth, necessarily — my focus is very much on the present and the future. For better or worse, I think I admire how Ketch’s music and songs, for example, are in the past and in tradition and I think he’s one of the best around. It just happens not to be the thing that sustains me as much. Did you play any other kind of music when you were a solo? Were you in any metal bands or anything like that? Not really, I’ve sort of [been] zeroing in on the same universe. Nothing newsworthy. Well, I’m sure all those years of solo in this kind of style got you primed for this duo. Yeah, I think so. 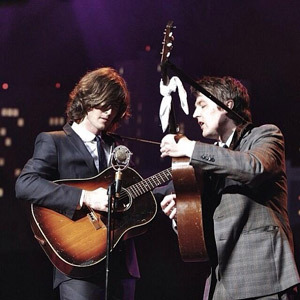 411: The Milk Carton Kids play Wednesday, September 30, at the Lobero Theater, 33 E. Canon Perdido St. For tickets and information, call (805) 966-4946 or see lobero.com.